This mirror consists of a ball decoration to the top with oval paterae to either side with a central eglomise painted panel below. This eglomise panel (reverse painted) consists of a foliate border with a landscape scene of a cottage within trees, a tall ship at sea with birds overhead and mountains behind. The original mirror plate, which is in good condition, is flanked by cluster columns with Corinthian capitals to the top all within a gilt and cream painted frame. 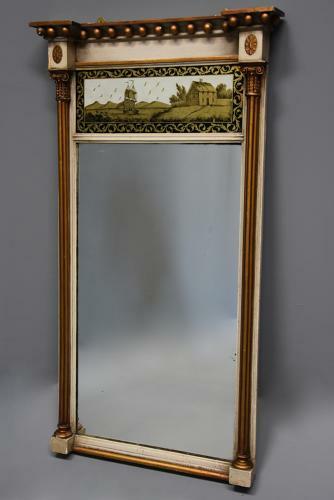 This mirror is in good condition for age, is of stable construction and can go straight into a home.